Town criers: shout loudly but not always clearly, don’t listen, make a big noise but actually only reach a tiny number of people. Frustrated philosophers: so interested in the academic niceties of marketing that they mostly fail to communicate with anyone. Secondary practitioners: they fell into marketing-like practices by doing something else and probably wouldn’t think of what they do as marketing. Professional visitors: one of the small but growing group of professional marketers employed by open source software companies, for whom open source is just another job. Further divided into those that engage with the community and those that don’t. The people that get it: they know the difference between free software and open source, they’re a part of the community and they know marketing. the Feature Freeze as well as String Freeze up to Test 3 freeze, March 19. This moves the general availability date from April 26 to May 24.
which I am attempting to set reply-to. This is my first try to write something useful using python .. so, please tell me if something not right with this plugin .. This plugin add a retry download functionality to yum when download errors happen. Those that got a fast and stable internet seldom get download timeout/checksum/no more mirrors error, but theres a lot of ppl in 3rd world n developing countries have slow/unstable internet and timeouts sometimes occurs too frequently. I wrote this plugin to make yum retry downloading for a few more times before die. 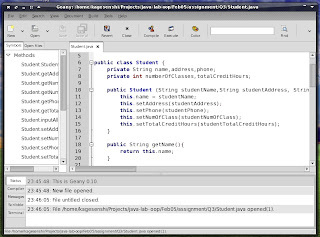 I installed JDK 6 RPM from Sun's Java SE download page for my Object Oriented Programming course. After installation, I was annoyed by all of my zipfiles and files that uses zip format to be identified as x-java-archive. This change created an annoying "Warning wrong filetype" when opening files that uses zip format but uses different extension - like ODF files. And when I select those files, their icons also changed to java-archive icons. Currently I'm using Anjuta for my assignments and course C/C++ work, but to me, Anjuta is too much for my simple day-to-day programming - which sometimes I just do it on Gedit or Vi - , so I decided to give Geany a try. To set up the repo, you'll need subversion, apache and mod_dav_svn. After getting the required packages, set up a place for storing the SVN repos in a suitable place. In this howto, lets assume we store it in /var/svn/. Just added a favourite icon for this blog. Thanks to a myOSS member, surface, for his howto.